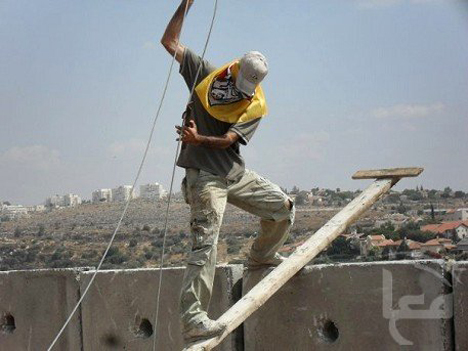 Bethlehem (Ma’an) – More than 100 farmers, youth, internationals and Israeli peace activists marched against the Israeli separation wall Friday and, armed with car tires and a homemade ladder to climb the high wall, they managed to burn one section and pull down three others. According to participants, one of the youth passed over the wall and set fire to car tires, damaging the fence and the sensors attached to it. A second group of youth burned a stack of 10 tires at one of the gates in the concrete wall, with black smoke billowing toward the nearby settlement. 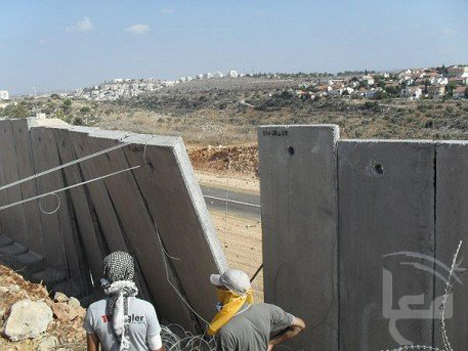 “This is the first message sent from Ni’lin’s people that the wall will not prevent them from going to their lands that were taken from them,” a statement from the local popular committee said. The committee reported that groups of demonstrators were met by 70 soldiers and 15 jeeps. Dozens of tear gas canisters were launched at the ralliers and many suffered from temporary respiratory problems due to the noxious fumes. Youth, who had been collecting full tear gas canisters that failed to detonate over the past several weeks of protests, began shooting these back at the soldiers. “This was a strong message from the village: ‘Shoot us, and we will shoot back,’” the statement said. Ni’lin is located west of Ramallah near the Green Line. Until 1948, villagers owned 58,000 dunums of land, which stretched as far as Ramle and Lod, cities that now lie inside Israel. After the Nakba (the 1948 expulsion and dispossession of hundreds of thousands Palestinians from their homes), 40,000 dunums of this land were annexed to the newly created Israeli state. Following the 1967 occupation, the colonies [or settlements] of Kiryat Sefer, Mattityahu and Maccabim were built on village lands. In addition, new roads were created for the ever-expanding settlements of Nili and Na’ale. Together, these settlements and their associated infrastructure claimed another 8,000 dunums of Ni’lin’s land. Moreover, an Israeli military base and scores of military checkpoints were also set up in the area. These confiscations left Ni’lin with just 10,000 of its original 58,000 dunums of land. 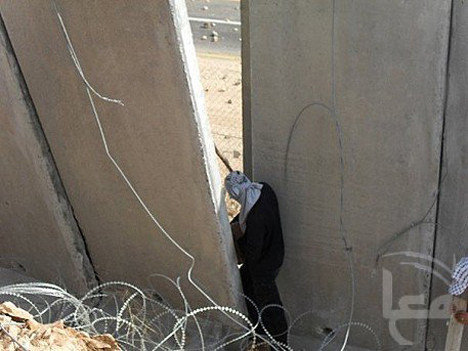 The current construction of the wall on the western side of the village and a military base on the southern side will strip Ni’lin of a further 2,500 dunums. This current confiscation must be seen with the context of the ghettoization project, as Ni’lin will be isolated from the rest of the West Bank, with its main entrance being a tunnel running under the segregated settler-only road. Not only will this involve the confiscation of a further 200 dunums, but it will also effectively give the Occupation military full control over movement in and out of the area. Four have been killed since demonstrations every Friday against the Wall began several years ago – Ahmed Mousa, 10, Yousif Amira, 17, Arafat Khawaja, 20, and Muhammad Khawaja, 22 – while scores more have been seriously injured or arrested. On March 13, 2009, Tristan Anderson, 38, from Oakland, California, joined a protest in Ni’lin and was critically wounded after Israeli forces shot him in the head with a high-powered tear-gas canister. He remains unconscious. A Facebook group called “Ni’lin’s Struggle Against Israeli Apartheid” is “designed to support the peaceful struggle of the people of the Palestinian village of Ni’lin against the confiscation of their lands by the Israeli military. “The construction of the wall, illegal Israeli settlements and settler-only roads around the village will turn it into a prison. The first part of this story is reposted from the Ma’an News Agency. The section headed “About Ni’lin” comes mainly from http://www.vimeo.com/4888842. Learn more at StoptheWall.org, the Palestinian Grassroots Anti-Apartheid Wall Campaign outlet for information about the wall as well as resistance to it on the ground. Thank you for the story on Ni’lin. Your coverage is amazing. I know that you’re a national publication, but what other one publishes such stories that deserve to be news everywhere?